It’s finally Spring here in the New York City area! Finally. Over the winter (while thinking about warmer weather) I designed my two new latest designs in my “insect” series: Ladybug Loop and Butterfly Bunch. For the last few weeks while we’ve been bouncing from spring-like days to days with frozen precipitation, I’ve been making butterflies like crazy. Butterfly Bunch is a foundation paper piecing pattern geared towards the confident beginner/intermediate paper piecer. 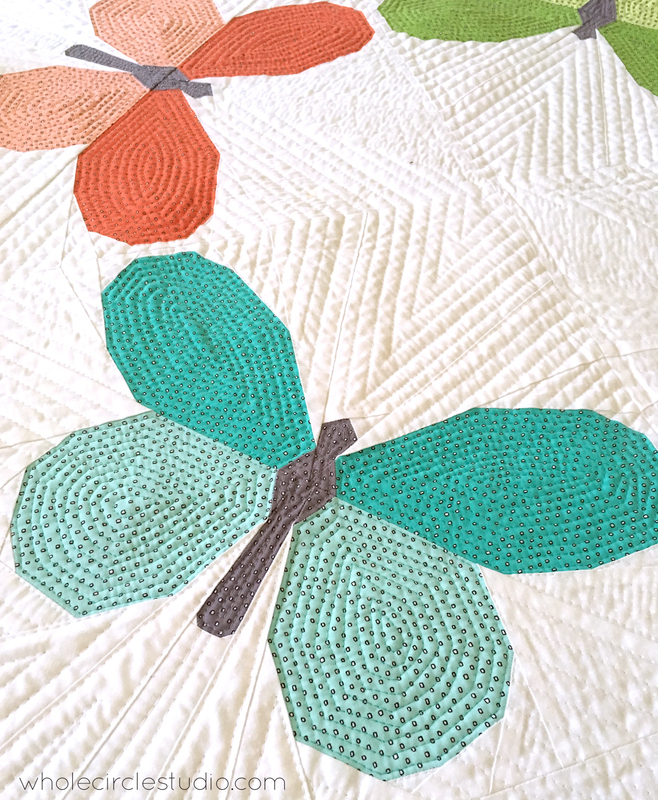 It’s comprised of four of the same 14″ x 14″ blocks and makes a mini quilt measuring 32″ x 32″ (with a border for the blocks you make). In the pattern, I also give ideas for different layouts using the blocks or you can invent your own layout. 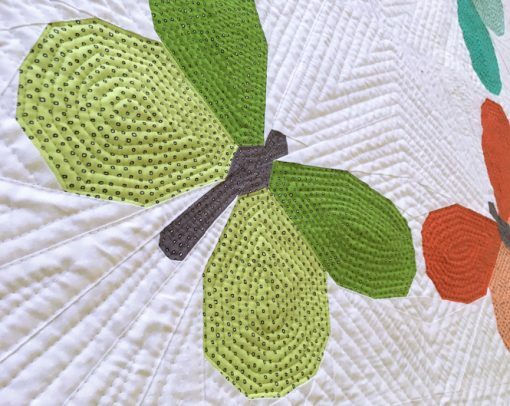 I love foundation paper piecing because of the unique designs you can achieve using this technique. I know there are many of you who share a love of paper piecing with me. I also know some of you get a bit frustrated at times and haven’t fully fallen in love with this technique (yet). 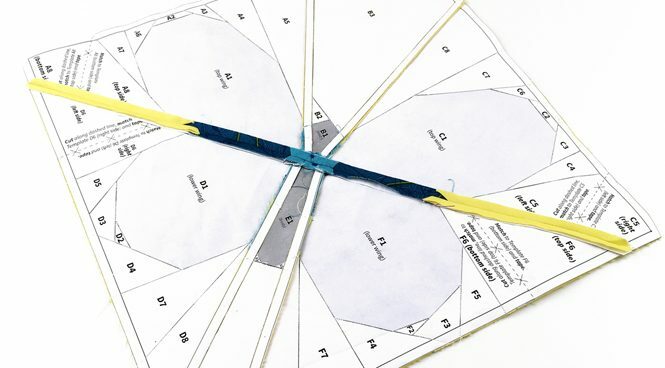 Let’s practice our paper piecing skills together! 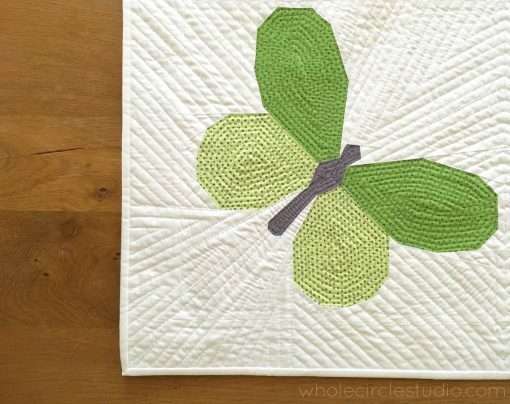 Let’s make a Butterfly Bunch quilt together! I’ve been playing around with different color options for more Butterfly Bunch blocks and will be making many more blocks. 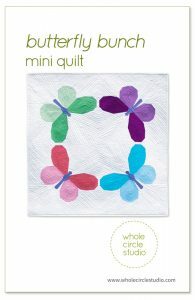 I was thinking that it would be fun to do a mini quilt along during the month of May. I will share my progress as well as some tips and tricks for staying organized and paper piecing along the way. By the end of the month, you should have a beautiful Butterfly Bunch mini that’s ready to be quilted. 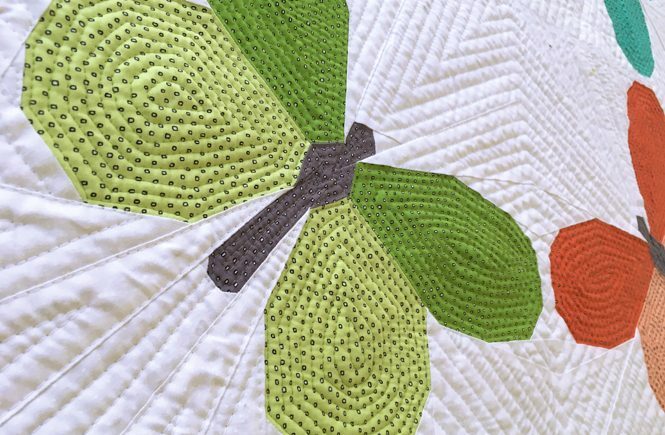 I’ll also give you some ideas and tips on how I quilted mine. 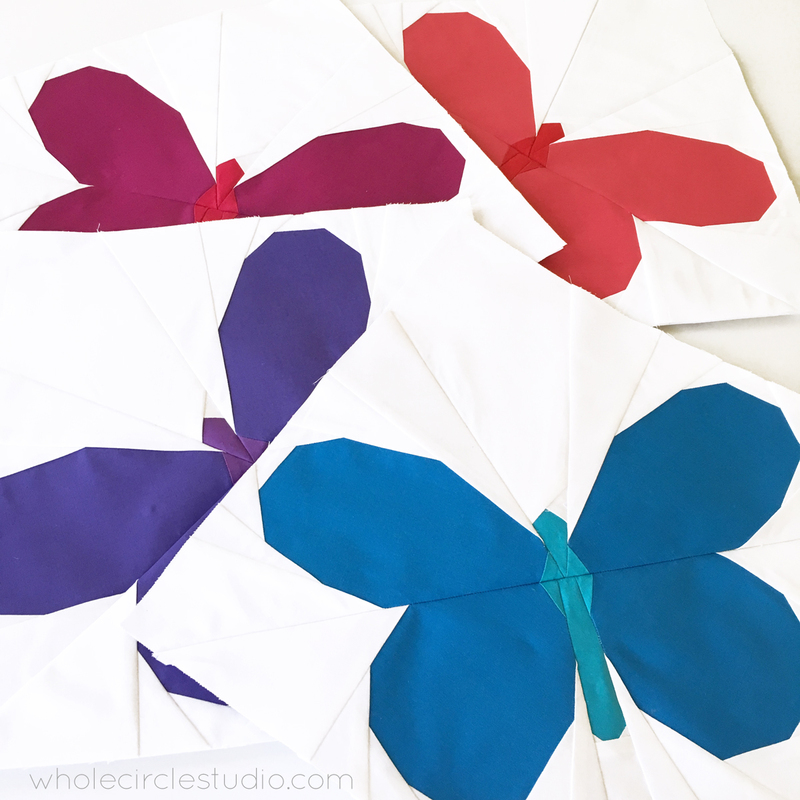 QAL Extra: Behind the scenes of designing Butterfly Bunch. QAL Week 1: Let’s get organized and ready! QAL Week 2: Digging in! QAL Week 3: Coming together! QAL Week 4: The home stretch. 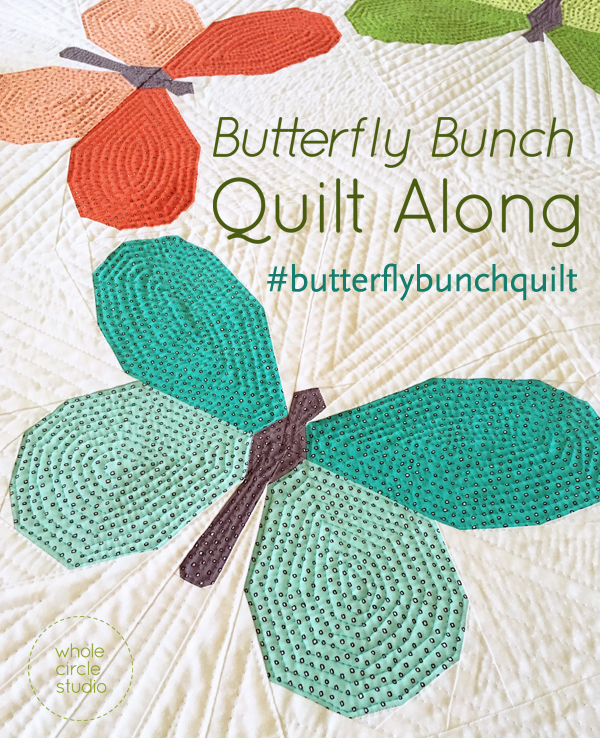 Use the #butterflybunchquilt hashtag on Instagram and post your progress. I’ll be checking in there as well. To start, you’ll need to get a copy of the Butterfly Bunch pattern. Get the PDF version of the pattern today at my online shop. Once you have the pattern, start thinking about fabric. 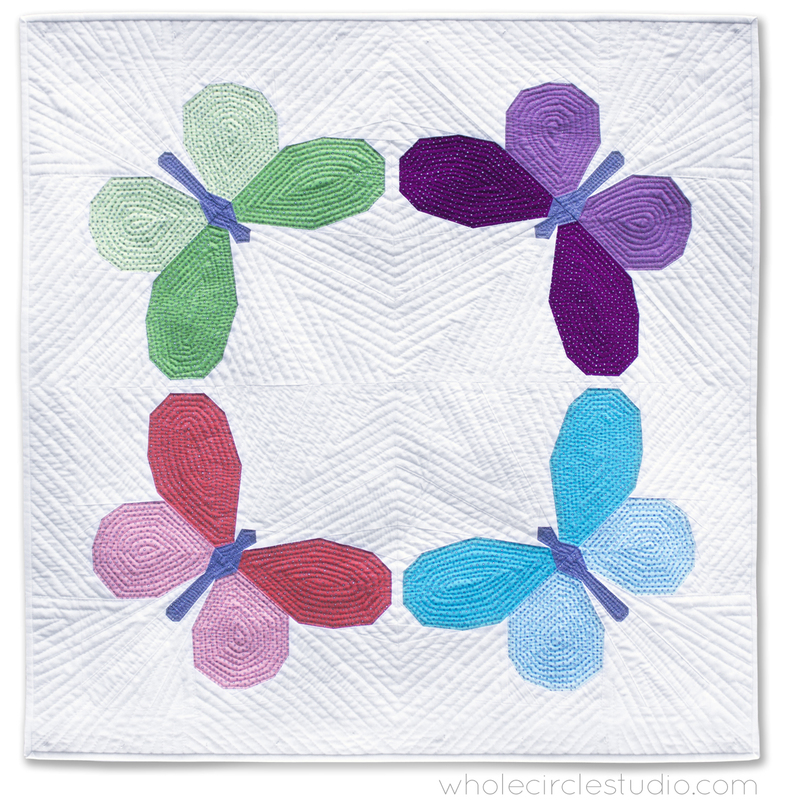 Use what you have in your fabric stash or fat eighths/fat quarters for the butterflies. We’ll dig into the coloring sheet and prep work next week. I’m looking forward to kicking things off next week and sewing with all of you! Be sure to check back next Thursday (May 3). Let’s make something awesome together!